Update: Check out Lovable Liberal’s remembrance too. Michael D. over at Balloon Juice has dredged up the inevitable In Flanders Fields as a token of memory on this sad day. For my part, two thoughts: first to McCrae himself. The poem was born of his direct experience that was fully immersed in the bloody and in-the-moment pointlessness of the war as anything Owen wrote. Read the story of how the poem came to be here. The third verse that so offends me?…I have no doubt that it was truly felt, the more so that the poem was written in the spring of 1915 — the first full campaign season in the trenches — and before the grinding fact of the four-year meatgrinder could fully crush its schoolboy bravado. In any event, he was there, he saw what he saw and felt what he felt, and he gets to express that emotion any way he damn pleases. It’s the use of the poem by those who have not earned that authority in the same way that gets me, especially now, in the wake of five years of war when my friends on the other side of keyboard wars have so often called for sacrifices as long as others make them. Maybe I’m the one fighting old battles here, in the new world after November 4, 2008, but I don’t think so. Second thought: here is one more poem just to make sure that I drive home the point about the cost of stupid decisions in war. Was proud to see him going, aye, and glad. Until he got a nice, safe wound to nurse. Sisters would wish girls too could shoot, charge, curse, . . .
And misses teased the hunger of his brain. From the best sandbags after years of rain. At the pleasure of this world’s Powers who’d run amok. Their people never knew. Yet they were vile. Carried him. This time, Death had not missed. We could do nothing, but wipe his bleeding cough. Could it be accident? — Rifles go off . . . It was the reasoned crisis of his soul. And life’s half-promising, and both their riling. *There is no shortage of great prose accounts of the disasters of the Western Front. The first I read were by two of the War Poets — Robert Graves, in Goodbye To All That, and Siegfried Sasoon in his trilogy collected under the title George Sherston’s Memoirs, now out of print. The central work of the trilogy, Memoirs of an Infantry Officer, can still be found. **Here’s a passage from my attempt to capture the relentless pointlessness of the so-called Great War at the level of the battlefield. The incident described took place 90 years ago to the day. Image: Red Poppies at the Menin Gate, Ypres, Belgium. Photograph taken on March 11, 2006. 1908, when the first wax cylinder recordings were made of the two nominees in a Presidential election. As Sean said, it’s a delight to realize that both of those topics are of purely historical interest. That was epochal then. No more secretely hired flacks to spread scandal, a la Jefferson and Adams (Good thing we don’t do that sort of stuff anymore). Now, of course, there is an entire industry devoted to using sound and image to permit the candidates to connect to an electorate with the (too intimate? )* illusion of direct one-one contact between individuals who never meet. 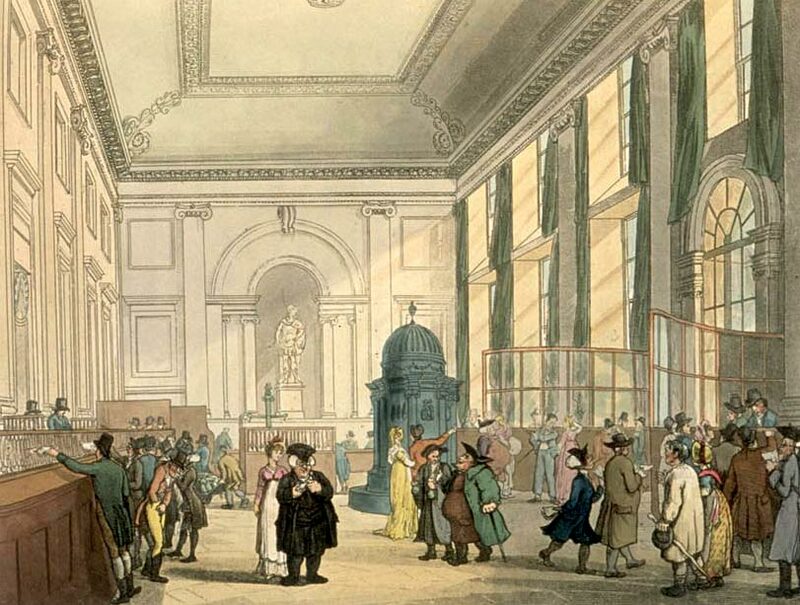 But what is so sweet about this story is that we can look back to a specific, single moment when it all began; if nothing else, the fact of such a sharply defined point of origin can help sharpen our thinking about what has happened since, for good and ill, at the intersection of mass media and politics. Beyond that historical piety, there’s just one thing I’d like to add to Sean’s thought: Taft’s and Bryan’s excellent adventure in audio is simply a reminder of how swiftly what we now take as almost immutable practice evolved from these humble beginnings. It’s in the range of personal memory, of experience that reaches right into the present. That is: My youngest great uncle lived into the 1980s — I had a chance to speak with him into my own twenties. He was born in 1900 — so soon before the census taker came to my great-grandparents’ house that he is listed on that year’s census form as Baby Levenson. He was eight when Bryan and Taft and Edison between them made it possible to connect voice to ear, emotional pitch to voter’s limbic system, at a distance of both space and time. 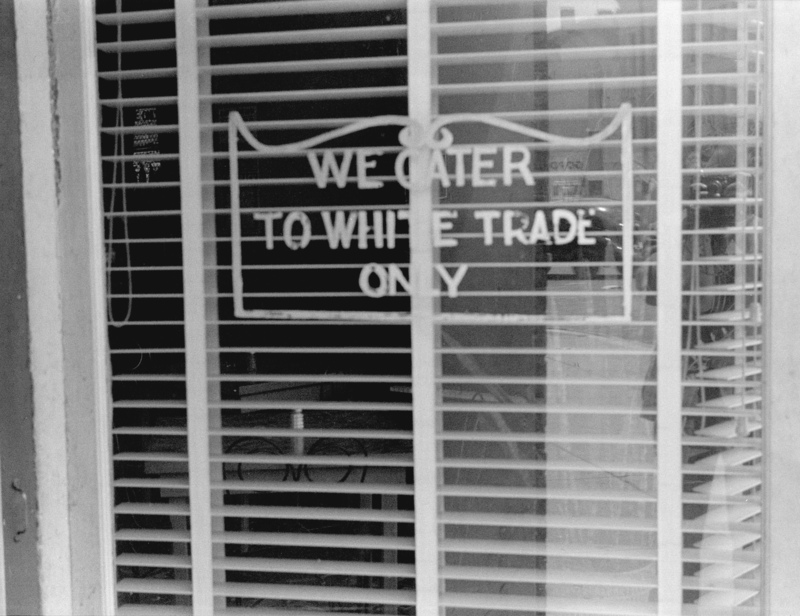 My Uncle Moe and I talked about these recordings, of course — if we had I would hope I would have had the wit to write the story up myself — but we did reach back into that history. He could tell me what it was like to see cars appear; to experience the end of World War I, to go to college and be the first in his Lithuanian-Jewish immigrant family to go to college and be able to major in something as not-obviously-useful as French literature. The larger point here is that the conventional division of time into generations misses the way historical memory actually works. If your grandfather is alive, he can tell you what his great aunt told to him. On my mother’s side, that means my grandfather, a career British army officer, would have known senior officers in his mess old enough to have observed the American Civil War, with all the lessons that did not sink in about what happens when you apply industrial methods to infantry tactics. On my father’s side, my grandparents were able to reach back into personal memory and immediate family experience of the life of Jews under Tsarist Russian rule. This is personal memory — one or two links of conversation at most. 1908 is even closer. In my own adulthood, I reach back with just one conversation to the lived experience of the moment American politicians’ voices first broke out of the constraints of time and place. All of which to say is that hearing Taft speak as if it were a century ago today should remind us that the transformation of modern politics into one dominated by modern media tactics is not an inevitable by-product of human nature, a required feature of democratic self governance in the 21st century. It is a very recent technological manipulation that turns, to be sure, on close observation of the ways people receive and interpret information and experience. But the 30 second hate spot is not some required response to a few million years of evolution from savanna to Savannah. *One of the repeated little pleasures of this election is watching conservative lip-flappers self-immolate. Rich Lowry, however, exceeds expectations (even accounting for the soft bigotry of low expectations), and the quote linked above has to rank with at the top of the OMG-Did-I-Just-Hit-‘Publish’ scale. 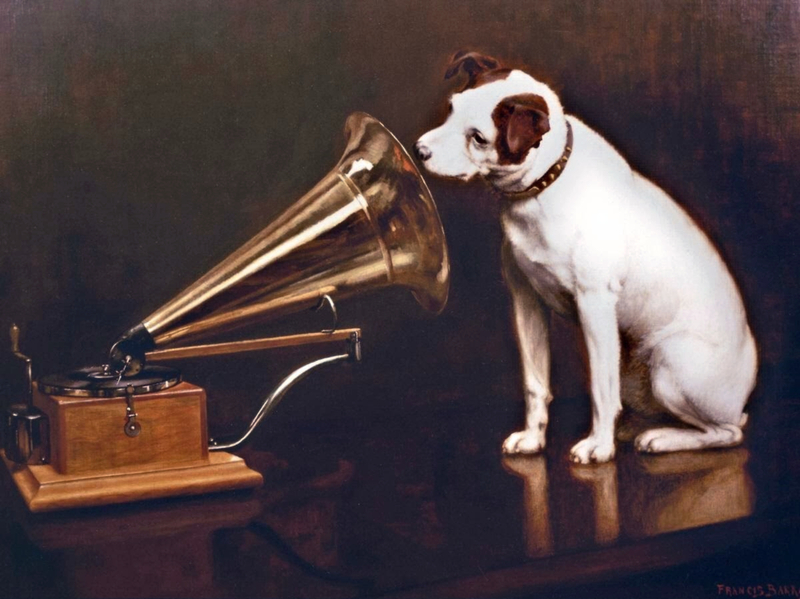 Image: Francis Barraud painted what became an iconic image of his brother’s dog Nipper listening to the horn of an early phonograph during the winter of 1898. Victor Talking Machine Company began using the symbol in 1900. Source: Wikimedia Commons. This may be a cliche (it is–Ed.) but it’s too good to pass up here. 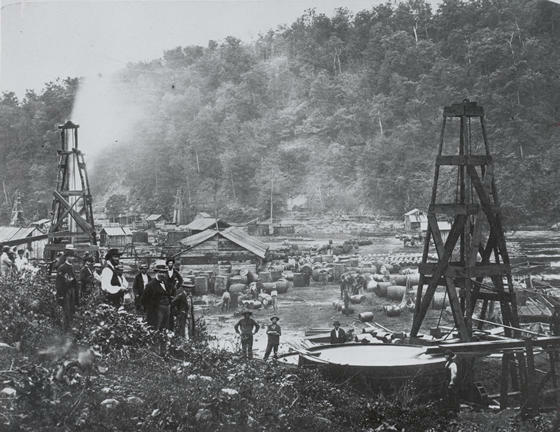 This image depicts an early oil field exploitation in Pennsylvania, around 1862. The two wells shown are the Phillips well and the Woodford well, both among the most productive of the time. Note the small distance between them. At the foreground appear wooden barrels in which the crude was stored, explaining why oil is still measured in “barrels”. Note the barrel size was not standardized yet : various size of barrels can be noticed.